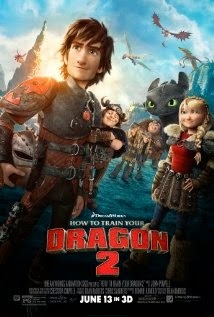 1) Voice Acting - Total Thumbs Up: Jay Baruchel is delightful as he reprises his role as the peace and dragon loving Hiccup. Wit and snark are served with fun aplomb by Kristen Wiig, Christophjer Mintz-Plasse, T. J. Miller, and Jonah Hill. Gerard Butler will make you cry as he tries to woo back the person he'd thought lost to him forever. 2) Artwork/Animation - Total Thumbs Up: Dreamworks continues to show their ever expanding skills in the animation field. With their efforts and the added 3D functionality, everything had texture, including human skin. The vibrant colors of the dragons were as dazzling as crystals during several scenes. Great care was taken in the formation of facial expressions, as in several spots that is solely what the audience has to go on. They were all easy to read and did much to elevate the watcher's emotional involvement. 3) Plot/Story - Total Thumbs Up: I've not read the series the movie is based on, though my nieces insist much was changed. But for those only acquainted with the DreamWorks version, I think you'll be quite happy with this new installment. Five years have passed from the time of the original film and all the kids have grown to different extents. The boys have definitely started noticing the girls and vice versa. It's background and comedic material, though in other ways it does permeate one branch of the main plot. Lots of cute or funny moments. Watching Hiccup and Toothless cavort around and play is always fun to watch. The subplot of Hiccup's Mom was nicely done. Drago though, didn't really have much depth. I would have loved to hear the tale of how exactly he got hold of his grand prize. Conclusion: "How To Train Your Dragon 2" was a lot of fun and definitely worth watching. It will also tug at the heart strings. Beautiful animation made even more fun by the 3D.